Telangana IT Minister K Taraka Rama Rao, who is known to be an avid movie buff, has recently taken his family to the acclaimed sci-fi thriller ’24’ starring Suriya. After watching the film, the TS Minister can’t stop raving about the screenplay and the path-breaking concept. 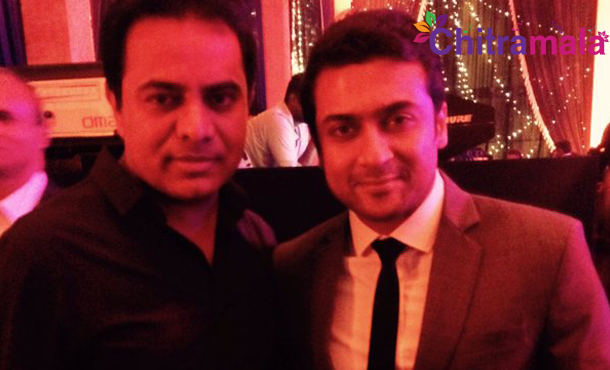 He requested Suriya for the watch used in the film for the sake of his children. “Just watched 24.Brilliant screenplay & terrific performance. Both my son & daughter want that watch now!” tweeted KTR. ‘24’ is running to packed houses across the world. The film has been received well especially in overseas and A centres. Suriya’s performance, director Vikram Kumar’s brilliant screenplay, visuals and the score of AR Rahman are getting appreciation from all corners.